When the jumbo jet that is Super Bowl XLVIII takes flight the various offensive pieces of both the Denver Broncos and Seattle Seahawks will hope their dream of scoring a touchdown in the biggest event of the year is realised. With the Peyton Manning-led Broncos blazing an offensive trail through the NFL this season there’s no shortage of options in the touchdown markets surrounding the men in orange. Manning threw 55 TDs to his teammates over the course of the regular season, more than any other team managed via the pass and run combined. Not only did the future hall-of-famer toss to the endzone with incredible regularity, he wasn’t scared to share the sugar among his various weapons either. Four players on the Broncos roster caught 10 or more touchdown passes this season, an NFL first, with wide receiver Demaryius Thomas leading the way on 14. He’s 1/1 to score a touchdown at anytime during the Super Bowl, which considering he’s Manning’s number one target, is terrific value. The other three 10+ TD receivers are fellow wide-outs Eric Decker and Wes Welker, who are both 5/4 anytime shots, and tight-end Julius Thomas who is rated as 11/8 to score over the course of the four quarters. 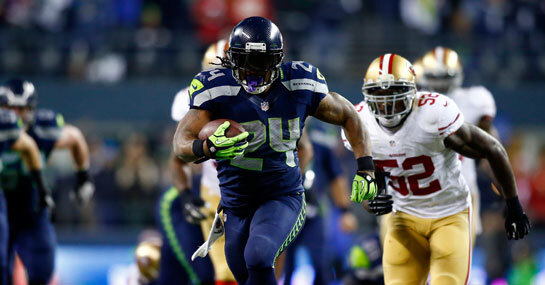 While the Broncos rely on Manning’s arm to guide them into the endzone, the Seahawks use the battering ram running-back Marshawn Lynch, known as Beast Mode. The 215 lb mountain bustled his way to 12 rushing touchdowns this season, a total which no other player bettered. In fact, his dominance is so potent that the Broncos have already admitted to taking a gang-tackle strategy on him. Considering no other Seahawk scored more than five touchdowns during the campaign, taking the 5/2 on Lynch being the first Seattle scorer is about as sensible as it gets.